The "Muppet Show" gave us pigs in space, but the latest Space Age technology is finding a meatier application here on Earth that may find its way to your Thanksgiving dinner table. The technology originally measured fluid shifts inside astronauts hamming it up in space. Now the European Space Agency (ESA) and two companies have adopted the tool to help ensure the quality of a world-famous Spanish cured ham. "The application was proposed by NTE, the engineering company that adapted the technology," said Jennifer Knoblach, a representative of ESA's Technology Transfer Programme Office. The new ham-scanning gear won't affect Thanksgiving plans for the 10 astronauts currently flying in space aboard NASA's shuttle Endeavour and the International Space Station. They're planning to celebrate Thursday's U.S. holiday tonight, one day early, with a traditional dinner of pre-packaged turkey, cornbread dressing, green beans, cranberry-apple desert and other space foods as a full crew, shuttle commander Chris Ferguson said. Prized "Jamon" ham represents a matter of culinary pride for Spain, and so only the highest quality hams get the label. Experts carefully examine hams to determine by look, touch and smell whether a ham is too wet, too dry or just right. However, the main factor for creating the perfect ham is the amount of water in the meat. Even the most experienced inspectors may find it difficult to determine a ham's water quality. Enter the device known as the Spectroscopy of Electrical Impedance. The instrument applies a low electrical current to astronaut bodies and analyzes the current's exit from the bodies to measure the upward drift of body liquids in space. The technology has already found use in medical and biotechnology applications on Earth, but the Spanish engineering company NTE saw a new opportunity thanks to an ESA technology broker network. The Technology Forum's online market matches up technology requests with available space technologies. ESA's Spanish technology broker known as Insamet helped bring NTE and the Spanish ham producer together. 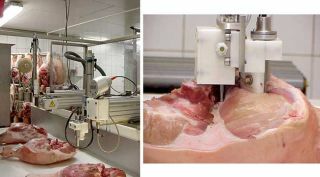 The device now sits on a ham production line and quickly detects whether hams meet "Jamon" standards. The producer has seen profits rise at a rate of 3 percent annually, and can ensure its customers better quality meat than ever before. This is the latest in a long line of over 200 space technologies that ESA has helped bring down to Earth. Successes include cooling suits for a Formula 1 racing team, ground penetrating radar to detect cracks in mine tunnels and several health care innovations. Not bad for technology beyond Velcro.